We tease the current “Millennial” generation of 18-31 year olds because so many of them are still living at home with their parents, whereas at the same ages we were either living in apartments or buying our first homes. On the other hand, they are saving a considerable amount of money that we effectively wasted on rent and utilities. Which generation is making the wiser decision? Yes, most of this “wisdom” is driven by necessity. The current generation of young Americans entering the workforce is often faced with the unenviable choice of either working a part-time job or having no job at all. However, just as our grandparents who lived through the Great Depression learned financial wisdom from their experience, the Millennials will learn (willingly or not) from their unpleasant entry into the adult world. Similarly, more employed Americans of all generations are choosing to forgo expensive vacations and opt instead for “staycations” where time off from work is spent at home. With the cost of a two-week vacation ranging from $2,500 (two people, no flying) to $8,000 (flying with a family), staycations make a great deal of financial sense. 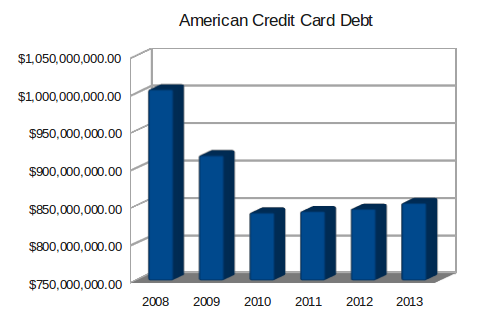 Americans are also becoming smarter, or more disciplined, regarding credit card debt. Since the economy turned South in 2008 Americans have cleared up a good amount of their private credit card debt. This is in spite of having less disposable income with which to pay off that debt. These are definitely good signs that Americans are becoming more financially literate. On the other side, however, is the rapid increase in student loan debt. Many Americans who cannot find jobs are choosing to go back to school. This is often a very good investment, but not always a good investment. The third-party payer problem which is currently plaguing the American higher-education system has caused the costs of a college degree to skyrocket completely out-of-control. The cost of tuition at American colleges has increased 498.41% since 1986 — over four times the rate of inflation. Many graduates will discover that they are unable to obtain jobs which provide a reasonable return for their investment. Student loan debt now exceeds one trillion dollars and that debt will have to be repaid by someone.